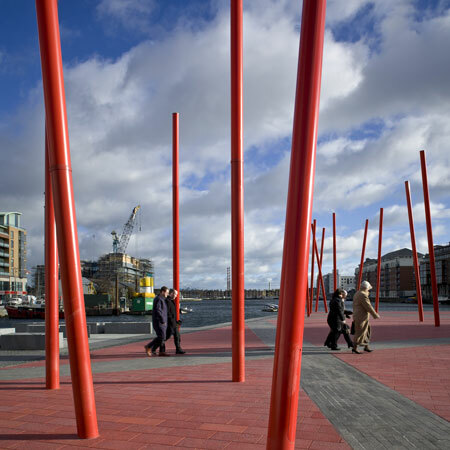 Landscape architects Martha Schwartz Partners have completed the Grand Canal Square project in Dublin, Ireland. Located at the western end of the Grand Canal Dock, the 10,000 square metre public space is overlooked by The Grand Canal Theatre, designed by Daniel Libeskind and due for completion next year. The €8 million project consists of red resin-glass paving that extends into the water, dotted with illuminated red poles. Planted sections are arranged diagonally across the square. Renowned landscape designer Martha Schwartz, of Martha Schwartz Partners, has completed the Grand Canal Square project in Dublin. At 10,000 sq metres, it is one of the largest paved public spaces in Dublin, a city that is increasingly renowned for regenerative design. It is a rare project, in that the public space is itself the focus of the €8 million project, rather than individual buildings, and is widely considered to be the most innovative landscape design project ever undertaken in the country. The square, which is located at the west end of the Grand Canal Dock, is home to shops, restaurants, The Grand Canal Theatre designed by Daniel Libeskind and Le Meridien 5-star hotel. The square has proven itself to be the centre point of a remarkable redevelopment of the city’s docklands. Martha Schwartz, President of the firm, said: “The use of light and space lures in the public, creating an interactive space that functions as a social magnet during the day and at night. The design features a striking composition of a red “carpet.” It extends from the theatre both into and over the dock, and is then crossed by a lush “green carpet” of planters with lawns and vegetation. The red carpet is made of bright resin-glass paving, covered with red glowing angled light sticks. The green carpet of polygon-shaped planters offers ample seating, and connects the new hotel to the office development across the square. The planters themselves feature marsh vegetation which softens the space, and acts as a reminder of the historic wetland nature of the site. Grand Canal Square is criss-crossed by granite-paved paths allowing movement across the space any possible direction, and also enabling the square to host major public events such as festivals and performances. Even on its own, in the absence of performers and party-goers, the space becomes highly theatrical at dusk, when it is illuminated by coloured lighting, designed by lighting designers Speirs & Major Associates. Martha Schwartz Partners (MSP) was founded in 1990 to provide a full range of landscape design services conceived and executed at the highest artistic level possible. Over the years, our practice has evolved from providing landscape services primarily for private sector urban environments to large-scale public projects, land reclamation and planning studies on complex sites. With considerable talent and experience, MSP brings balance between environmental practice and aesthetics to national and international projects ranging in scale and scope from public plazas, parks, master plans, reclamation, mixed-use developments to art commissions and private residences.